During Masters Week you always want to have some good wine on hand, whether you are a local hosting friends, or a visitor celebrating a special week. Everyone tries to step up their game this week, and one good way to do that is serve a Bordeaux. There are many great wines produced all over the world, but traditionalists will always return to Bordeaux, long considered the cradle of great wine making. One of the especially nice things about Bordeaux is you can find good wines at all prices. Unless you are among the superrich or trying to impress someone, you won’t be serving one of the first growths, so it’s nice to find something a little more affordable. With the Lasségue Saint-Emilion Grand Cru 2011 ($64-66) you can splurge a little and still get that great Bordeaux flavor without breaking the bank. It is a beautiful deep red in the glass with powerful aromas of ripe black fruit. The first sip will tell you why so many people make a fuss about Bordeaux wine. It has layers of blackberry and black cherry flavors that keep getting better as you sip the wine, with some interesting herbal notes. The tannins are still strong, but they don’t overpower the wine. I suspect this wine will keep getting better for at least another 5-10 years as the tannins fade, leaving even more fruit flavor. French wines usually don’t tell you the blend, but this is a Right Bank Bordeaux, so merlot is the predominant grape. This blend is 62 percent merlot, 30 percent cabernet franc and 8 percent cabernet sauvignon. Chateau Lasségue is fermented in stainless steel tanks. The wines are aged in an average of 50 percent to 70 percent new French oak barrels for 15 months prior to bottling. The oak barrels used at Chateau Lasségue are unique because the cooperage is owned by one of the families who own the winery. Vintages change from year to year in France more than in many New World countries, so it is important to know how a vintage was rated. But with 6,000 growers in Bordeaux, it also pays to learn something about a particular wine you are considering. The 2011 vintage is considered austere following a benchmark 2010 vintage. But the Lasségue rises above the vintage with this intricately layered, smooth wine. Wild strawberry flavors come through from the cabernet franc grown in limestone soils. Merlot brings elegant texture and subtle mineral notes. The overall package is elegant and smooth, wonderful for any special occasion. Chateau Lasségue has been undergoing a renaissance of sorts since it was bought by an American couple and a French couple in 2003. Jess Jackson and his wife Barbara Banke joined winemaker Pierre Seillan and his wife Monique to breathe new life into the winery. Seillan’s Verité wines earned 13 100-point scores from famed critic Robert Parker. 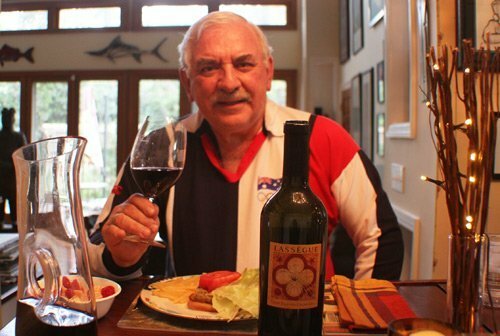 Wine visionary Jackson lured Seillan to Sonoma to make Bordeaux style blends and they continued the partnership when they bought Chateau Lasségue. The vines are old, with an average age of more than 40 years, but the winery and tasting room are renovated. There is a certain something about Bordeaux wines that set them apart, a taste you don’t find in red blends from other parts of the world. They are usually more complex, often with herbal and mineral notes. Growers don’t water their vines, so the roots are forced deep into the earth, which some think develops the complexity of the wine. Growers have been tending vines there for hundreds of years, in some places since the Roman empire. Over that time they have figured out which varietals grow best in each location and type of soil. The grapes allowed in a red Bordeaux are cabernet sauvignon, merlot, cabernet franc, petit verdot, malbec and carmenère. Cabernet sauvignon is generally dominant on the gravel-rich Left Bank; merlot is preferred on the Right Bank. Cabernet franc plays a strong supporting role in both areas, whereas the other three grapes’ importance has dwindled. 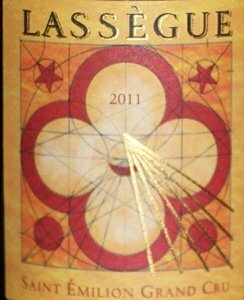 Winery: Chateau Lassègue was built in the 1600s and ancient sundials on the building are highlighted on the label. The beautiful property is just outside the historic town of St. Emilion, where the Romans were making wine two centuries ago. The chateau was passed down through generations of the founding family until Jess Jackson, Barbara Banke, and Pierre and Monique Seillan bought it in 2003. Jess Jackson has since died, but Banke and the Seillans continue to make improvements. The 60-acre estate is planted to 60 percent merlot, 25 percent cabernet franc and 15 percent cabernet sauvignon. The terroir is chalk, clay and limestone soils. The old vines have a perfect southwest exposure with protection from northern winds. After the two couples bought the estate they renovated the winemaking facility to fit with Seillan’s micro-cru philosophy. They installed all-new equipment for vinification and implemented new viticulture practices. The vineyards are divided into small blocks to take advantage of the complexity of the soil. On the chateau’s south-facing exterior the two iconic vertical sundials (les cadrans) that were created more than 250 years ago were restored. Images of these sundials also adorn bottles of the estate’s flagship wine, Lassègue, and its second label, Les Cadrans de Lassègue, which is named for them. A third label is Chateau Vignot. The founding families had a vision that the wines of Chateau Lassègue would be recognized as one of the premier producers in the region. That vision is shared by the next generations of their families as Katie, Julia and Christopher Jackson work alongside Hélène and Nicolas Seillan, united by this same family spirit. Since 1999, the medieval village of Saint-Emilion and its surrounding vineyards are a Unesco World Cultural Heritage site. It is a gorgeous place to visit, as is all of the Bordeaux region. Goes with: We had this superb Bordeaux with grilled homemade cheeseburgers, which proved to be a perfect combination. You can save your Bordeaux for a fancy dinner, but serving it with an everyday dish like a cheeseburger really elevates what would be a so-so meal. I use about a pound of high-quality ground beef, such as chuck or ground round. I mix that with about a third of a sweet onion, diced, and two eggs. I also liberally add Morton Nature’s Seasons. I mix it all thoroughly and form 5-6 patties, each a little thicker than a deck of cards. I get the grill hot, around 400 degrees or so, and place the patties above the coals for about 5-6 minutes per side. You need to be careful not to let the meat burn, which it can do over hot coals. After cooking on each side I move the patties to indirect heating and top each one with a slice of cheese. Close the grill and let the patties sit for 2-3 minutes, or until the cheese melts. 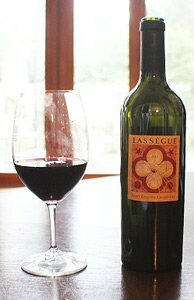 The powerful Lasségue was a great match for the flavorful burgers and French fries we served with them. The black cherry and strawberry flavors mixed perfectly with the hearty meat flavors. I also enjoyed sipping the rest of the wine after dinner. This is a wine that loves meat, so you could serve it with all kinds of meat dishes, such as beef, veal, pork, lamb, duck, game or roast chicken. It also is a good match for Asian dishes, rich fish courses like tuna, or with mushrooms and pasta. This wine will be at its best if you serve it chilled, about 61-64 degrees. You can put it in the refrigerator for about 15 minutes before you open the bottle and serve it.